Elephant Rocks are located 15 kilometres from the town of Denmark in William Bay National Park, south-west WA, about a 4.5-hour drive from Perth. 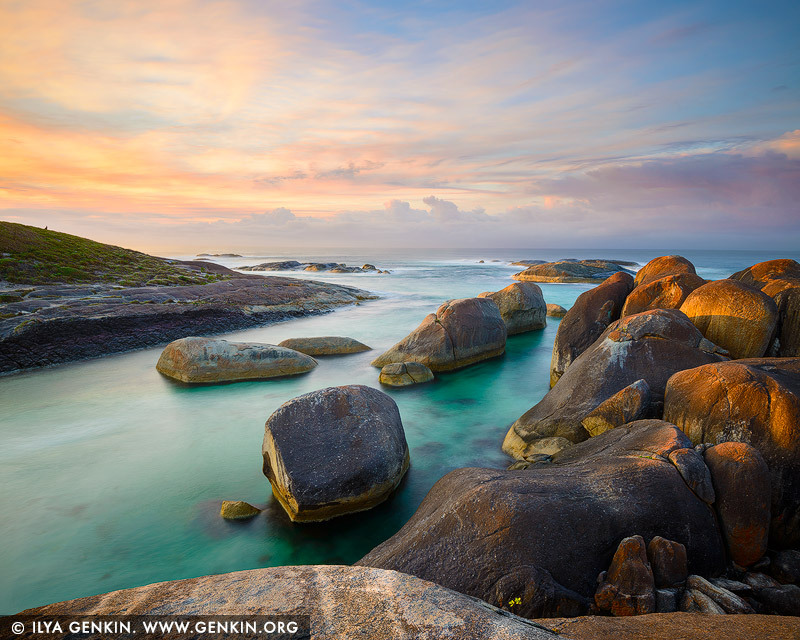 Elephant Rocks and Greens Pool are part of the William Bay National Park known for its rugged coastal scenery. Elephant Rocks are named after the two large elephant-like granite boulders that occupy the upper part of the beach. The steep 60m long beach is located in a 60m wide gap in the bordering granite. At the shore it is fronted by more boulders, which narrow the small bay to about 20 m in width. It widens past the boulders into a protected deep pool in lee of more granite reefs extending 100m seaward, with high wave breaking on the outer rocks. This sheltered beach is absolutely stunning and perfect for family relaxing, swimming and snorkelling. This image belongs to the travel and nature stock photo library. This stock photo of Elephant Rocks is available for licensing for commercial and editorial uses including websites, blogs, books, magazines, brochures and advertising. Restrictions may apply for images which contain third party copyrighted material or sensitive subjects. Photos of artwork are for editorial use only. This image id AU-WA-ELEPHANT-ROCKS-0002 of Elephant Rocks, is copyrighted © by Ilya Genkin. This is not a public domain image.